Miss Kiddy and the Cads presents the ultimate in Vintage Musical Sophistication with a modern twist.... from David Bowie to Beyonce, the delectable Miss Kiddy and her fiendish Cads give the hits of the 21st Century a Vintage make over with swinging beats, toe-tapping finesse and stunning glamour! The ultimate vintage act for every event… from weddings to large scale corporate events (especially those with a decadent theme! 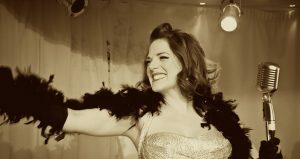 ), Miss Kiddy and her fiendish Cads give the songs that all your guests will know and love an uptempo swinging make over with some cheekiness thrown in… perfect to dance the night away! 5 piece band (with optional dancer as 6th member) performing 2 x 45 mins sets of music for dancing. 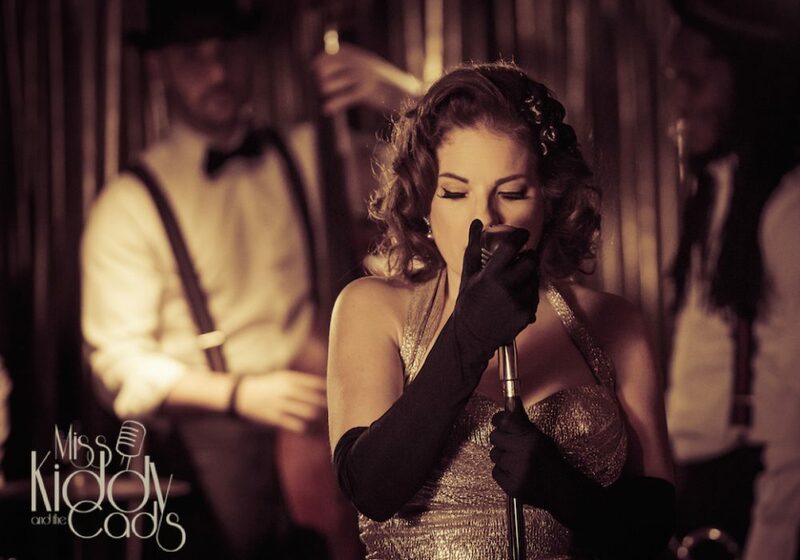 Ideal for intimate events or occasions, set in a downtown jazz club in 1945 the show introduces the delectable Miss Kiddy in all her pin up starlet glory backed by her infamous Cads… a notorious ensemble formed of the most wanted, the most shady characters on the music scene. 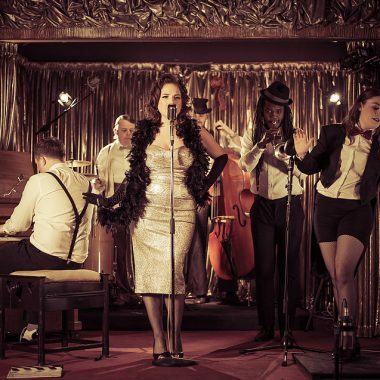 The audience is taken on a musical journey through the life of Miss Kiddy set to a vintage soundtrack of contemporary classics… a great guessing game in itself! As the story unfolds, the individual ‘mafiosa’ characters of the fiendish Cads come to life and the audience warms to this unexpected ‘family’ of jazz rebels. Show stopping vocals, stunning authentic costumes, spectacular tap dancing routines, and a story of suspense not to mention a great deal of audience participation and laughter. For larger scale events the ‘show’ can be more back to back show stopping hits to keep the focus of big rooms. 6 piece band featuring tap dance, performing after or during dinner entertainment. Up to 2 x 45 min sets for the full show or 1 x 15 – 60 min set for after dinner entertainment. Miss Kiddy and the Cads can perform in a reduced line up as a stylish and original take on background music. 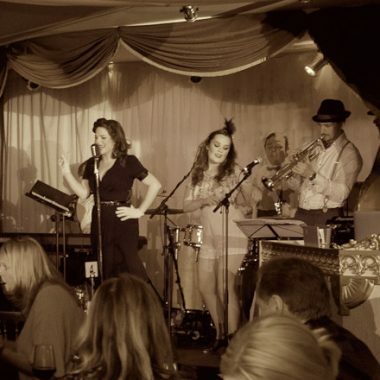 A stylish mix of classic pop hits from the 60’s to the present day and the best in jazz and rat pack favourites all of which are familiar to the audience, but all in their own special arrangements. Miss Kiddy can perform with either 1, 2 or 3 of her Cads: Keyboards + double bass adding on trumpet for a complete jazz quartet.